Dr. Nathan Hardy Ambler (1824-1888) was born in Huntington, Vermont, to a family of dentists. He himself became a dentist in the early 1840s. In 1845, he married Martha S. Buell. 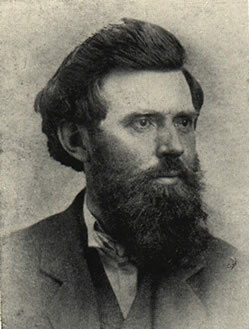 He joined the California Gold Rush in 1849 and amassed a small fortune (he was paid for his dental work in gold dust). He opened a dental practice in Cleveland in 1852. He also dealt in real estate, buying property on the outskirts of Cleveland and reselling it as the city grew, eventually becoming a millionaire. By 1872, Dr. and Mrs. Ambler had built a large home called Rock Rest on a hill between the present Fairhill Boulevard and Cedar Avenue (just southwest of Ambler Heights), now the site of the Baldwin Filtration Plant. In 1868, Ambler turned full-time to real estate development. He was assisted by his adopted son, Daniel O. Caswell (1857-1906), from Lodi, Ohio. Together they developed Blue Rock Spring House, a regionally renowned water cure resort/sanitarium operating between 1880 and 1908. Ambler died in November 1888 and is buried in Lake View Cemetery. Martha Ambler died in 1901. Dr. and Mrs. Ambler died childless (a daughter had died in childhood), and they made Daniel Caswell their heir. undeveloped. By 1892, it had been platted as "Ambler Park," in which there were to be several large lots along the top of the ravine, along with many more, much smaller lots laid out in a north-south, east-west grid pattern. A few of the larger properties were sold during the 1890s, and about five homes were built; but apparently the streets were never constructed and none of the smaller lots were sold. The Cleveland Park Commission was active during the 1890s, acquiring land for a city park system, and in 1894 Martha Ambler donated 25 acres south of what is now North Park Boulevard for Ambler Park. 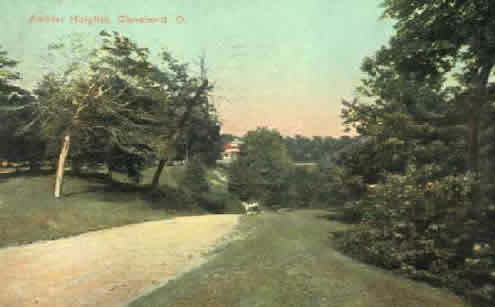 Ambler Parkway (now North Park Boulevard), running through the park, was surveyed in 1895. By 1900, Daniel Caswell had formulated a new concept for the land north of Ambler Parkway. He hired Charles W. Pratt to lay out "Ambler Heights" for marketing to an upscale clientele. Pratt's plan included all of the land in the previous design for Ambler Park, except for a small portion at the western edge which was physically located far below the elevation on which Ambler Heights was built, and apparently was excluded for that reason. Ambler Heights today is almost identical to Pratt's plan, with the only significant exception being along the western boundary (where the extension of Chestnut Hills Drive connecting to Ambleside Avenue and Park Boulevard does not exist (and apparently was never built), and Park Boulevard (now Martin Luther King, Jr. Boulevard) has become a busy thoroughfare separated geographically and in feel from Ambler Heights. Shortly after, Caswell, with William Eglin Ambler (1845-1925), Dr. Nathan Ambler's nephew, began marketing the area. Pratt laid out a neighborhood for comfortable living, with wide, gently-curving streets. To the south and west, treed ravines provided natural borders. At the north boundary ran Patrick Calhoun's street railway extension. Immediately adjacent on the east were the links of the Euclid Club, an exclusive golf club operating from 1900 to 1914. Lots were generous and irregularly shaped to accommodate natural features. The streets were lined with trees. Deed restrictions provided for minimum frontage widths and minimum setbacks from front and side property lines, placed a floor on home valuations and prohibited multi-family dwellings. Just south of North Park at MLK, this path leading into the Roxboro Ravine no longer exists. Note the Benjamin Bourne house at upper left (corner of North Park and Harcourt). Leaders of the Cleveland business community soon built homes, including Dennis Upson, president of the Upson Nut Company; George Hascall, president of Hascall Paint Company; Alva Bradley, chairman of the Cleveland Builders and Supply Company; Edward Brown and Ernest Brown of the Brown Brothers Stores; A. V. Root and S. K. Root of The Root-McBride Company; Benjamin Bourne, president of the Bourne-Fuller Company; and George Canfield, president of the Canfield Oil Company. They were followed by other prominent families, including those of Joseph O. Eaton, chairman of the Eaton Axle and Spring Company; Amos Barron, president of the Amos Barron Company; Charles Cassingham, president of the Cassingham Coal Company; and Samuel Halle of Halle Brothers Department Stores. By 1912, 31 homes had been built in Ambler Heights. By 1920, Ambler Heights included about 56 homes of similar style and quality. By 1927, building of the district was substantially complete. Many of the homes in Ambler Heights were designed by the city's leading architects, including Frank B. Meade and the firm of Meade and Hamilton; Walker and Weeks; Abram Garfield; Charles S. Schneider; Howell and Thomas; Bohnard & Parsson and Harlen E. Shimmin. In addition, several homes were designed by Boston architect Charles R. Greco. They are mostly in the Colonial Revival and Tudor Revival styles. There also are examples of Georgian Revival, Italian Renaissance Revival, Prairie School, French Renaissance Revival and Shingle Style designs. The Ambler Heights homes clearly reflect then-evolving concepts of suburban home design: a sense that domestic architecture should have aesthetic merit, but should be designed for comfortable family living. Rather than being tall and formal, homes generally have a long horizontal dimension parallel to the street. The garden facades are often viewed as equally important as the street front and are as architecturally developed; many feature elaborate permanent garden layouts and decorations. Facades feature the natural textural qualities of stone, brickwork, wood and small panes of window glass. Interiors include spaces planned for the comfortable grouping of people-large living rooms with fireplaces as focal points, private spaces such as studies and libraries, and sunrooms and porches oriented to the garden. Homes are elaborate in their detail, reflecting an interest in craftsmanship and materials, and are very well-built, taking advantage of the high quality of handicraft that was still available.